4.3 Steps To Add A Custom Serial Login Device: "/dev/ttyS1"
This page describes different methods for setting up a serial console post booting up an NST system. See Getting Started - Server Boot for setting up a serial console initially during a NST Live boot. By default, the Linux kernel that comes with Fedora (and hence the NST) enables 4 serial devices (/dev/ttyS0, /dev/ttyS1, /dev/ttyS2 and /dev/ttyS3). If your hardware has more than 4 total serial devices, you will want to add the "8250.nr_uarts=COUNT" parameter to your boot options in /boot/grub/grub.conf. The above output provides clues that /dev/ttyS0 mapped to the serial port on the motherboard (which is what you would expect). However, the other port addresses indicated that the eight serial ports on the SeaLevel PCI adapter did not map out as you would expect. The first physical port on the SeaLevel PCI adapter mapped to /dev/ttyS4. The clue here was that ports on the SeaLevel adapter started at port 0xC800 (as shown by the lspci output below). Why the sixth port on the PCI adapter (at port 0xC828) mapped to /dev/ttyS1 is a mystery, but at least the output above helped to sort out the mapping. Use the following command to manually enable the serial console on NST versions 2.13.0 using upstart. This example will set the serial baud rate to: "57600" and use serial device: "/dev/ttyS0". A user login prompt should now be active on serial device: "/dev/ttyS0". See the topic: "Enabling systemctl Bash Completion" for making it quick and easy to complete the systemctl command. Use the following command to manually enable a serial terminal on NST versions 2.15.x or above using systemd. This example will use the current baud rate (agetty -s option) set typically during a boot time and use serial device: "/dev/ttyS0". If one needs to adjust the baud rate, send a break character on your communications application to cycle through the baud rate list (i.e., In this example: 115200, 38400 and 9600). Steps To Add A Custom Serial Login Device: "/dev/ttyS1"
Use the following procedure to add a custom serial login device under systemd control. In this example we will add the ability for user login on the second serial device: "/dev/ttyS1" using a fixed baud rate of 57600 and 8-bits clean with no flow control. Note: This has been changed to 115200 baud since the NST 28 Interim release. 1. Get a copy of "/lib/systemd/system/serial-getty@.service" and place it in directory: "/etc/systemd/system" and give it a custom name (e.g., "serial-getty-fterm@.service"). drwxr-xr-x. 7 root root 4096 May 22 20:30 .
drwxr-xr-x. 4 root root 4096 May 15 19:22 ..
2. Edit custom file (Using 57600 baud): "/etc/systemd/system/serial-getty-fterm@.service" and set the fixed baud rate of 57600 on the "ExecStart" line. # instead, to ensure that login terminates cleanly. 2. Edit custom file (Using 115200 baud): "/etc/systemd/system/serial-getty-fterm@.service" and set the fixed baud rate of 115200 on the "ExecStart" line. 3. Create a symbolic link in directory: "/etc/systemd/system" using serial device: "/dev/ttyS1" to custom file: "/etc/systemd/system/serial-getty-fterm@.service". This will make the configuration permanent across reboots. drwxr-xr-x. 2 root root 4096 May 22 20:26 .
drwxr-xr-x. 7 root root 4096 May 22 20:25 ..
4. Manually control systemd using systemctl to startup the login service via agetty on device: "/dev/ttyS1". systemd will do this automatically during the boot process. 5. Check the current service status for serial login on device: "/dev/ttyS1"
This section will describe the steps needed to attach a serial device to an NST Virtual Machine (VM) under VMware Workstation (v7.1.x or greater) control for serial console output. This will allow one to examine the complete boot sequence via the serial console output including boot strapping the Linux Kernel. 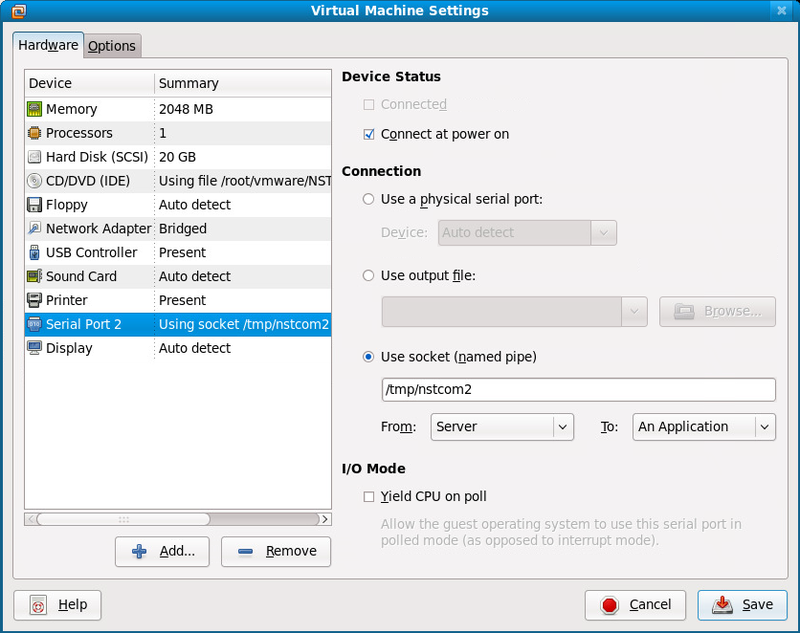 See the article: Using the VMware Workstation emulated serial port on a Linux host for advanced usage (i.e., Howto setup a Linux Kernel serial debugger) of the serial console under VMware Workstation control. 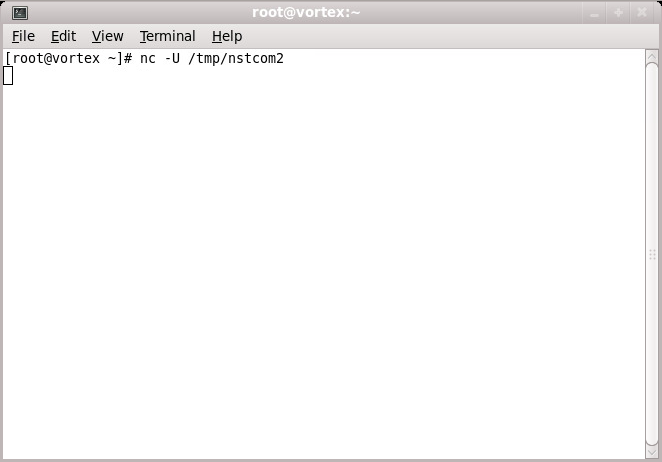 In this example we will add a Unix Socket connection serial type and use the nc (netcat) utility for attachment to the socket (I/O) in a Gnome Terminal. Alternatively, one could use the minicom terminal emulation program and set the serial device to point to a Unix socket (e.g., "unix#/tmp/nstcom2"). 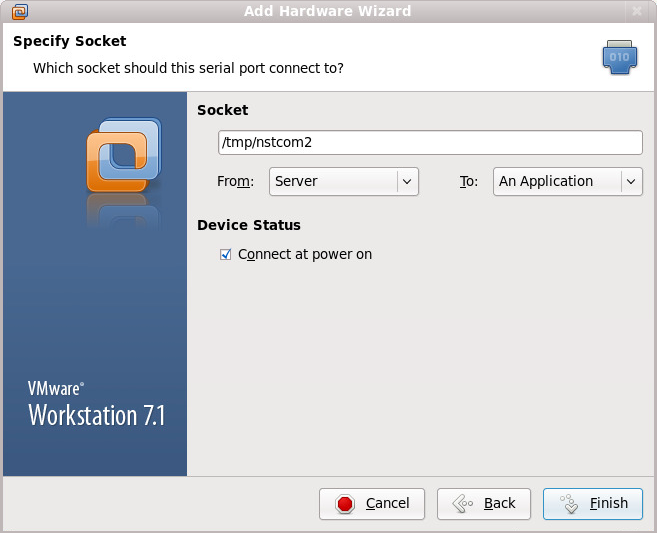 VMware Workstation - Device: Serial Port 2 with Unix Socket: "/tmp/nstcom2"
2. The Unix socket: "/tmp/nstcom2" will not be created until the VM is started by VMware Workstation. Therefore, in order to see the entire serial console output, start the VM with "Power On to BIOS" (Menu Sequence: VM => Power => Power On to BIOS). Once in the BIOS, the socket will be created. 3. Now on your Linux host system, startup a Gnome Terminal. Make sure you edit the "Profile Preferences" set the Scrollback to "unlimited" to capture all serial console output. 4. Start the nc utility to use: "UNIX-domain sockets" and attach it to the socket created by VMware Workstation (i.e. nc -U /tmp/nstcom2). 5. 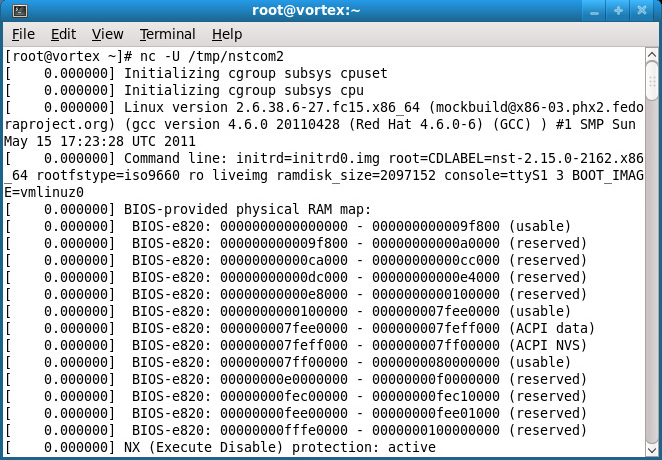 Now back on the NST VM, exit from the BIOS setup menu to either the NST Live SYSLINUX menu or the NST GNU GRUB boot menu. Select a boot choice and add the kernel parameter: "console=ttyS1" to it. Use the <tab> key for editing an NST Live menu boot choice or use the 'e' key to edit an NST GNU GRUB choice. 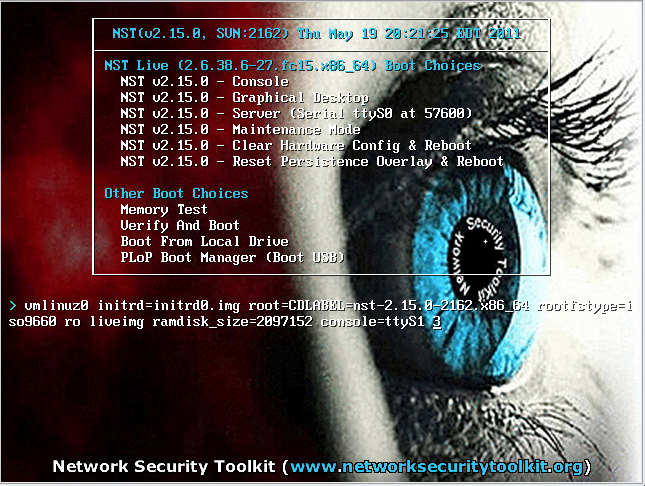 Below is a screenshot for editing the NST Live boot choice: "NST v2.15.0 - Console". 6. Now continue booting your NST VM and serial output should be directed to the Gnome Terminal. Since this is a serial console one can also log into NST after the VM has booted. Gnome Terminal: Serial Console Output - Device: "/dev/ttyS1"
7. One can list the attached serial console devices using the following. Enable a virtual serial port. 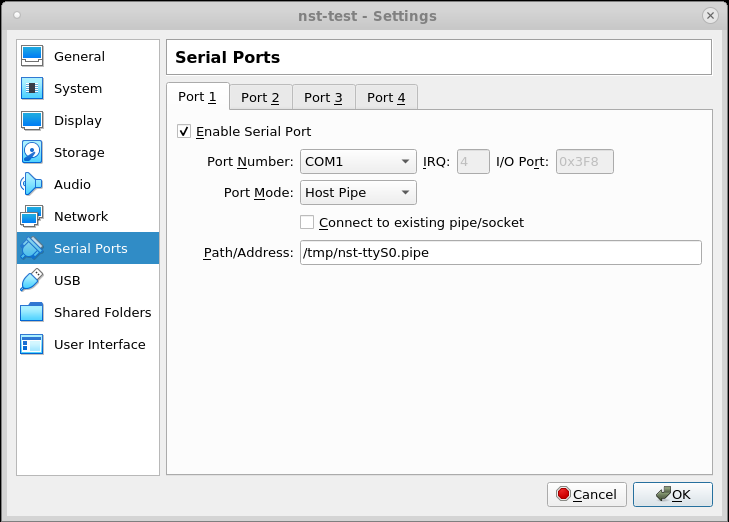 Set the virtual serial port mode to Host Pipe. 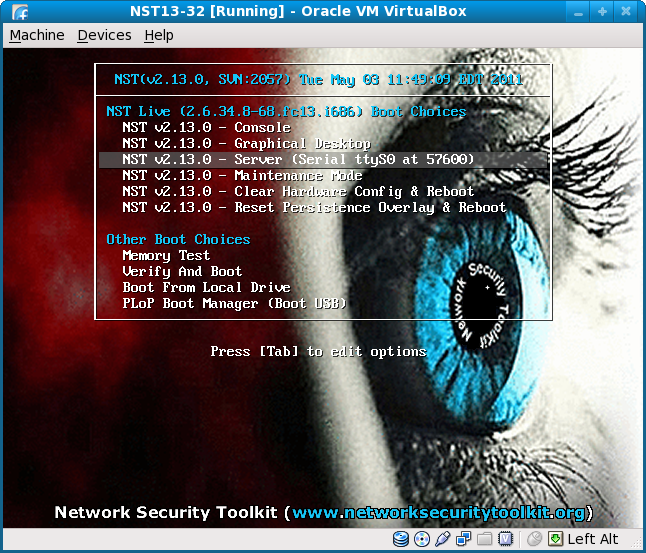 Use the nc (netcat) utility running in a Gnome Terminal to monitor virtual serial output from the NST booted within VirtualBox. Select your virtual machine and then click on the Settings icon. From the settings panel, select Serial Ports on the left side and then select the Port 1 tab. The Unix pipe: "/tmp/nst-ttyS0.pipe" will be created when the virtual machine is started (not before). So, the trick to capture everything is to be ready to start the nc command in a gnome-terminal when the virtual machine goes through its initial BIOS routines. Type in the following command, but do not hit Enter - just get the command ready to run. Power on your virtual machine and as soon as you see the BIOS screen, press the Enter key in your gnome-terminal to start the nc command. Click back on the virtual machine window and use the down arrow key to select the Server boot mode. At this point, you can press the Enter key in the VirtualBox window to start the boot process. You should see the entire boot log appear in your gnome-terminal where the nc command is running. NOTE: This appears to grab all console output (any other devices you originally had configured to capture console output may no longer do so). This page was last modified on 24 August 2018, at 10:37. This page has been accessed 214,624 times.